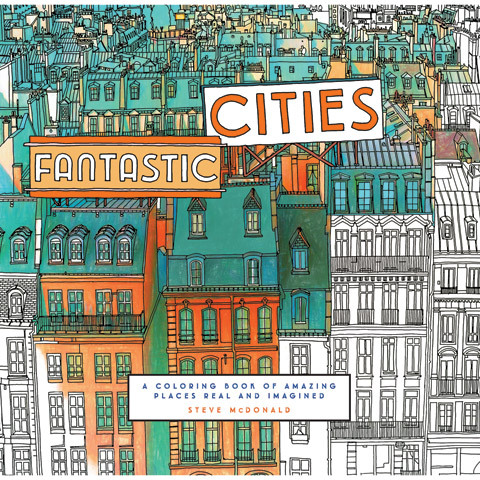 This coloring book features immersive aerial views of real cities from around the world alongside gorgeously illustrated architecturally-inspired mandalas. Artist Steve McDonald's beautifully rendered and detailed line work offers bird's-eye perspectives of visually arresting global locales from New York, London and Paris to Istanbul, Tokyo, Melbourne, Rio, Amsterdam and many more. The book's distinctive large square format offers absorbingly complex vistas to color, the crisp white pages are conducive to a range of artistic applications and a middle margin keeps all the artwork fully colorable. Complementing the cityscapes are a selection of mind-bending labyrinthine architectural illustrations for still deeper meditative coloring adventures and imaginative flights of fancy.